Update: Google has discontinued Google Related. The extension is no longer available for Google Chrome. Additional information about the decision are available on the Google blog. Google Related is a brand new extension by Google for its Chrome web browser. 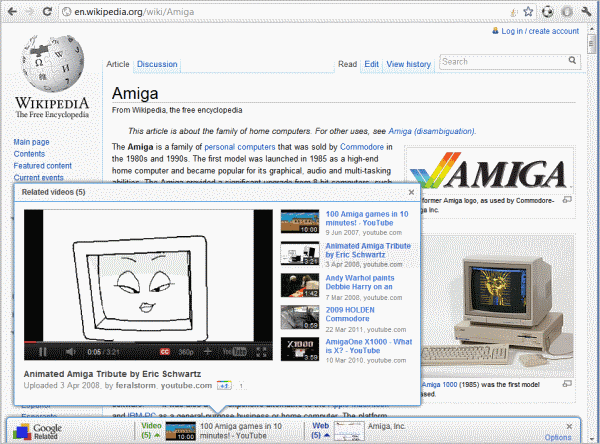 The extension acts as a browsing assistant displaying related news and contents in a small bar at the bottom of the browser window. This process itself is automatic. The related information that are displayed on the toolbar at the bottom of the browser screen are directly related to the open web page. It happens quite often that the toolbar does not open at all, but if it does, it displays relevant information that are related to the contents on the website. On news sites for instance, links to additional sites with news, videos and images are displayed if available. On shopping sites, you might get price comparison information and links to accessories. The toolbar displays information on mouse over. One interesting feature is that some of the information can be displayed directly in that overlay window. This is the case for videos and images that the extension suggested as related to the current page. Some information on the other hand, like web links, open in a new browser tab. Whenever you’re navigating to a new page, Google Related will look for interesting related content and, if available, display it in a bar at the bottom of your page. Google Related can display categories such as videos, news articles, maps, reviews, images, web sites and more. To preview a listed item or see additional items, just use your mouse to hover over different categories in the bar. For example, when you hover over a video link, the video pops up in a preview box and you can play the video directly on the page. A video has been published as well. Interestingly enough, the video mentions that Google Related is available for both Google Chrome and Internet Explorer. The web page on the other hand states that Google Related requires Google Chrome 11 or higher. Google Related os also be part of the Google Toolbar which would explain this discrepancy. Google Related works mostly on English Internet pages currently. Toolbar users furthermore need to have google.com configured as their Toolbar's search engine.